"James Douglas-Hamilton's fascinating book sheds light on the remarkable story of Rudolf Hess's peace mission" writes Lord Lexden for The House Magazine. You'll be £14.99 closer to your next £10.00 credit when you purchase The Truth About Rudolf Hess. What's this? 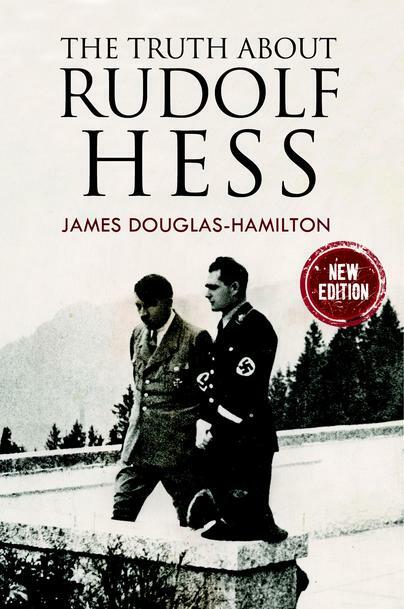 In a new expanded and updated Paperback Edition of his book “The Truth about Rudolf Hess” James Douglas-Hamilton examines the background to this extraordinary affair and the myths which surround it. He traces the developments which persuaded Hess to undertake his deluded attempt to broker a peace deal and remove Britain from the War, so that Hitler would not have to fight on two fronts when his planned attack on Russia was launched. The author also examines the unsought involvement of his father the Duke of Hamilton in the story when, although they had never met, Hess asked to speak to him after he parachuted into Scotland. The part played in this affair by the previously little known Professor Albrecht Haushofer, an academic and Anglophile, who acted as Hess’ consultant, is highlighted and his doomed journey through the horrors of Nazi Germany leading him to a terrible fate is recounted. Douglas-Hamilton's book does justice to this hero. The latest tranche of previously secret government files examined in the book show how determined the government was to disprove the claim that the man imprisoned in Spandau Prison was not in fact Hess but was a double. They also cast light on the reasons for the Russian authorities’ implacable determination that Hess should never be released. The author’s research shines a spotlight on the important part played in the Hess saga by his consultant Albrecht Haushofer. Superb book. Thoroughly enjoyed reading, rereading and reading again! The author's research shines a spotlight on the important part played in the Hess saga by his consultant Albrecht Haushofer. The extent of the author's personal victory over unduly secretive officials is evident in this memorable and moving book. Many questions have been asked over the years about Hess's doomed peace mission. Was he insane? Did Hitler have any advance warning? How did his plan elude British radar? Why didn't Churchill exploit this propaganda gift to embarrass Hitler? Why did Hess remain in prison until his suicide in 1987, long after other Nazi leaders had been released? Definitive answers can be found in this absorbing book. This is an excellent read quite apart from being a credible analysis of the events surrounding Hess's decision to come to Britain. New evidence enables the author to dismiss many of the conspiracies surrounding the most bizarre event of the war. He does this very effectively, leaving little left uncertain. An interesting amount of attention is paid to Albrecht Haushofer who was hugely influential in Hess's decision to come to this country and to seek out the Duke of Hamilton whom he had never met. This book is a must for those interested in war history but it is also a rewarding read for those with a more casual interest. It is a very important contribution to war history. in a new and expanded edition of this book, drawing on wartime documents and reports (including many which were only declassified just in time to be included) James Douglas - Hamilton, the son of the Duke of Hamilton, has revealed the truth about Hess, and in doing so, produced one of the most absorbing books I have read for a long time. James Douglas-Hamilton read history at Balliol College, was a Boxing Blue and President of the Oxford Union. After a spell in the legal profession, he became the Member of Parliament for Edinburgh West, and later a Scottish Office Minister. From 1999 to 2007 he was a Member of the Scottish Parliament and now sits as a Life Peer in the House of Lords.